Light Emitting Diodes, or LEDs for short, are miniscule electronic devices. LED bulbs are typically built from silicon or germanium. The manner in which they are built allows electricity to flow in one direction only. When the diode resists current flow, rather than converting the energy to heat, it produces a bright light. By changing the impurity type and percentage of the LED bulb, the color of the light can be altered. It is even possible for an LED bulb to "sweep" through a range of colors or the entire visible light spectrum. LEDs are also capable of producing light with a wavelength outside the visible range of the human eye. 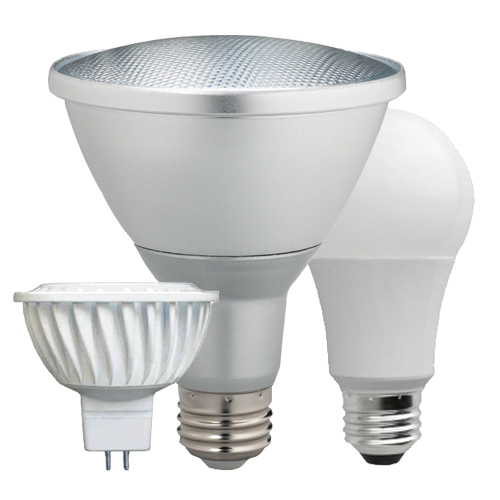 LED light bulbs can be comprised of one LED or many. They come in a number of form factors, such as LED PAR38, GU10, PAR20, PAR30, MR16 and T8. They can be mounted in light fixtures that are powered by DC or AC current. However, in the event that AC is used, a transformer and rectifier must be installed to convert the current to a usable form. LED bulbs can range from the size of a large flood light to an organic LED, or OLED, that is roughly the size of a speck of dust. LED light bulbs are far more energy efficient than older incandescent or florescent bulbs and by comparison, emit extremely little heat, consume less power, do not flicker and produce a softer light with less glare.